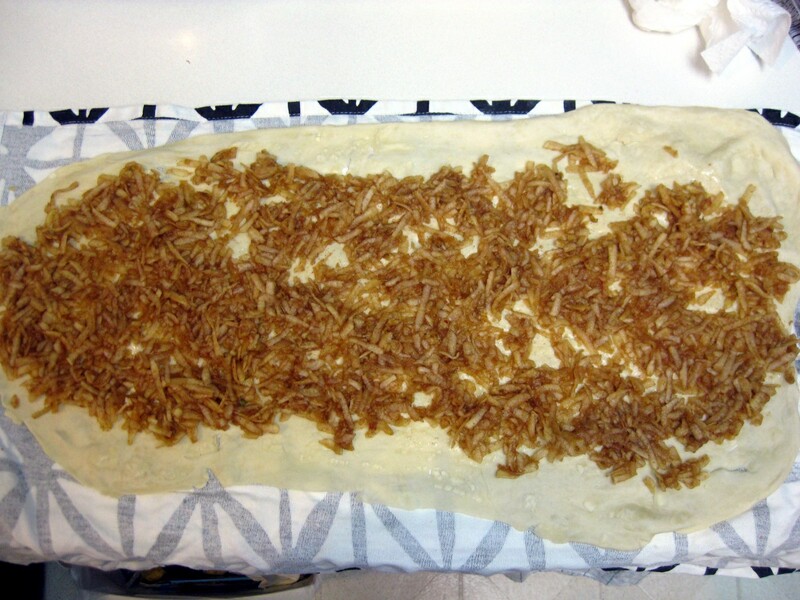 Here is a recipe for an easy apple strudel (jablková štrúdla or more traditionally, jablkový závin). 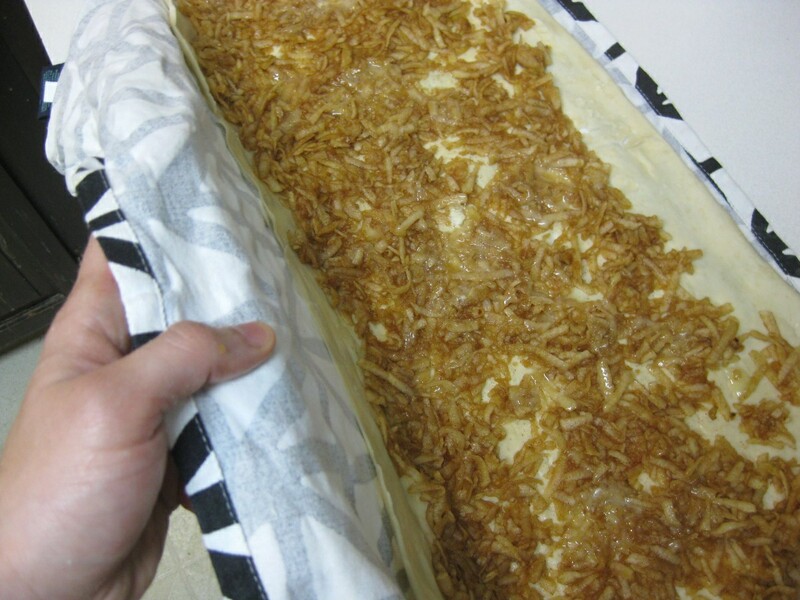 It’s easy because it’s made with frozen puff pastry dough. So all you have to do is grate some apples, mix them with sugar and cinnamon, roll the strudel, and bake. And eat, of course. 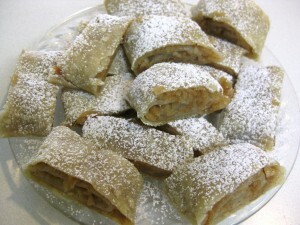 And if you have never had an apple strudel, it’s really delicious. It’s sort of like an apple pie, but better. 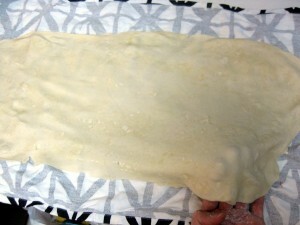 In making this recipe I used the frozen puff pastry dough from my local Giant. 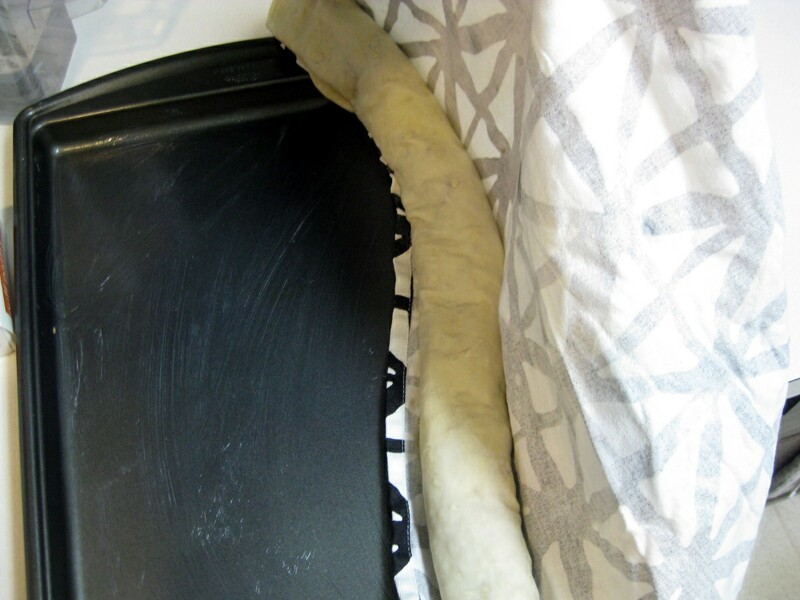 You will need to let this dough defrost for at least 20 minutes. This is also a good time to preheat your oven to 400F. 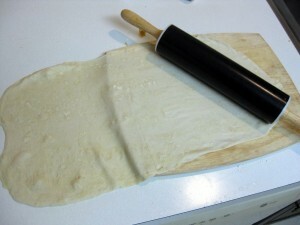 The dough comes folded into three sections. As it is defrosting, carefully unfold it to make a flat sheet. 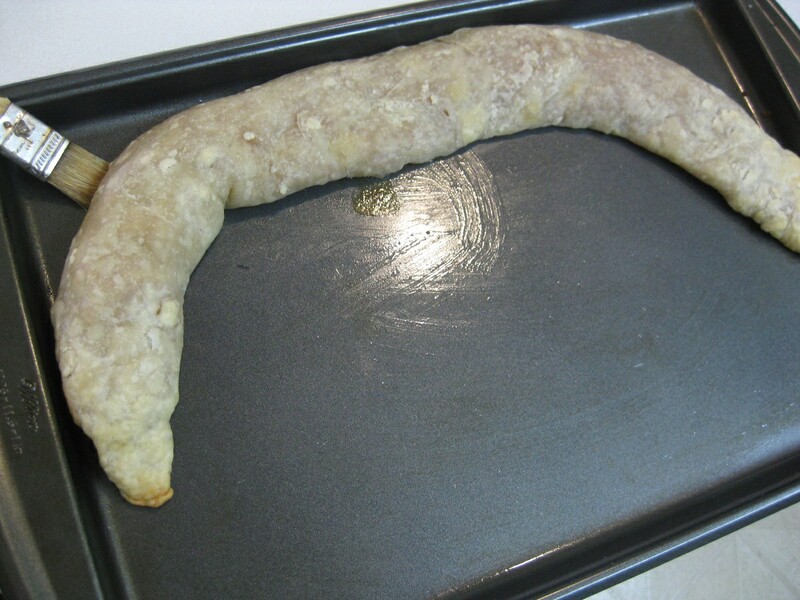 For some reason, one third of the dough I was using was really stiff and non stretchy – perhaps it suffered a bad freezer burn. 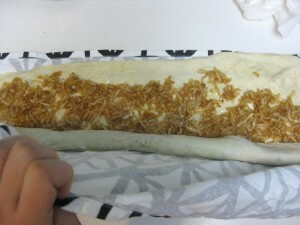 I tried to wet it, and roll it with a pin, but to no avail. 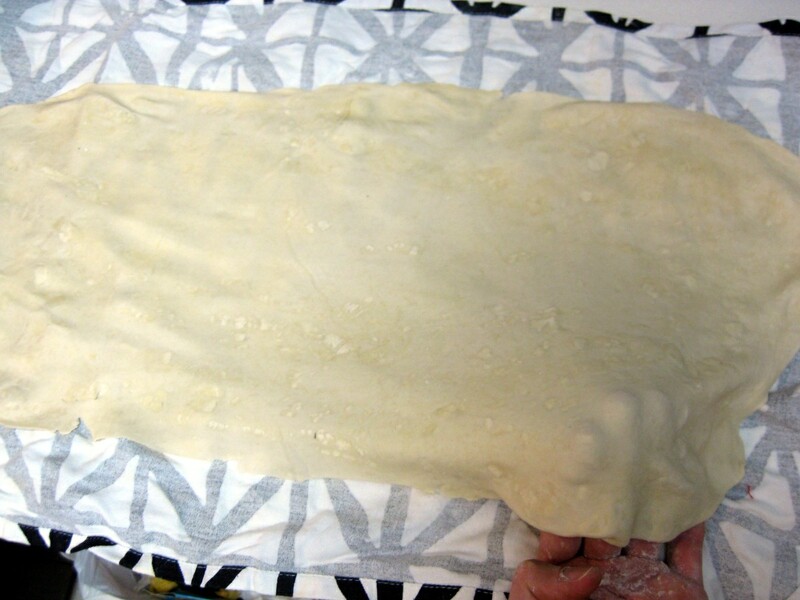 I eventually ended up forming dough into a ball and rolling it out flat as shown below. Here are the ingredients you will need to make an apple strudel: puff pastry dough, apples, and cinnamon. You will also need sugar and butter. Peel the apples and grate them using a coarse grater. I used 4 smallish Gala apples. 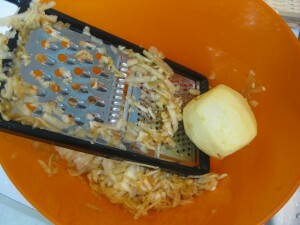 Squeeze the grated apples with your hand and drain out the juice. Add sugar and cinnamon and mix well. Roll the dough out into a long rectangle. Transfer it carefully onto a tablecloth (obrus) or a large dishtowel. I dusted the towel first with flour, but this may not be necessary. 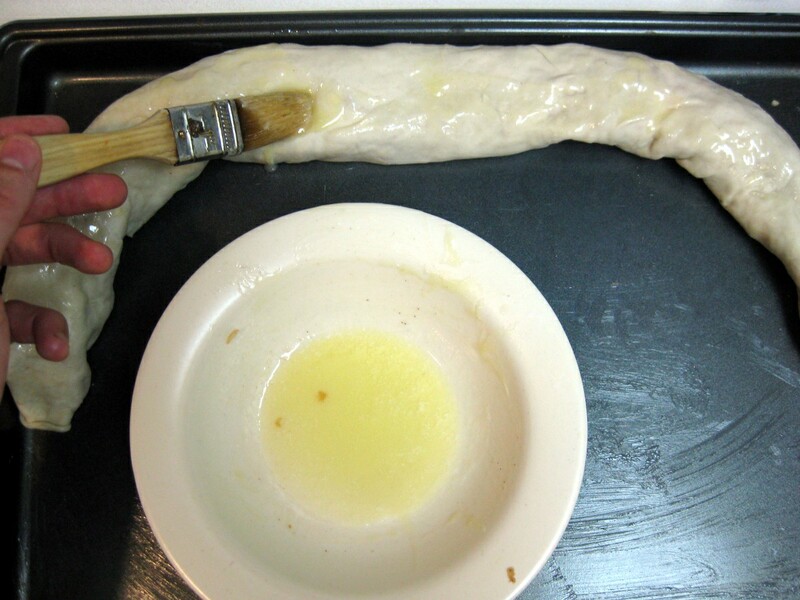 Then place your hand underneath the dough and using your fingers gently stretch the dough out as much as you can before it breaks. It will become semitransparent. Do this from inside out and all the way around. Top the dough with the apple mixture and also brush on some melted butter. 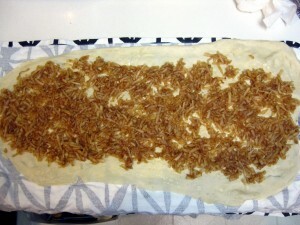 To roll the strudel, lift up one end of the tablecloth with both hands. Bring it over the dough so that the edge separates from the tablecloth and folds over. Continue doing this until you end up with a roll. Then carefully using the tablecloth transfer the strudel onto a greased baking sheet. Generously brush with melted butter. Bake in oven preheated to 400F for about 20 minutes. About half way through, brush gently on all sides with melted butter. Also brush on the bottom to keep it from sticking to the pan. 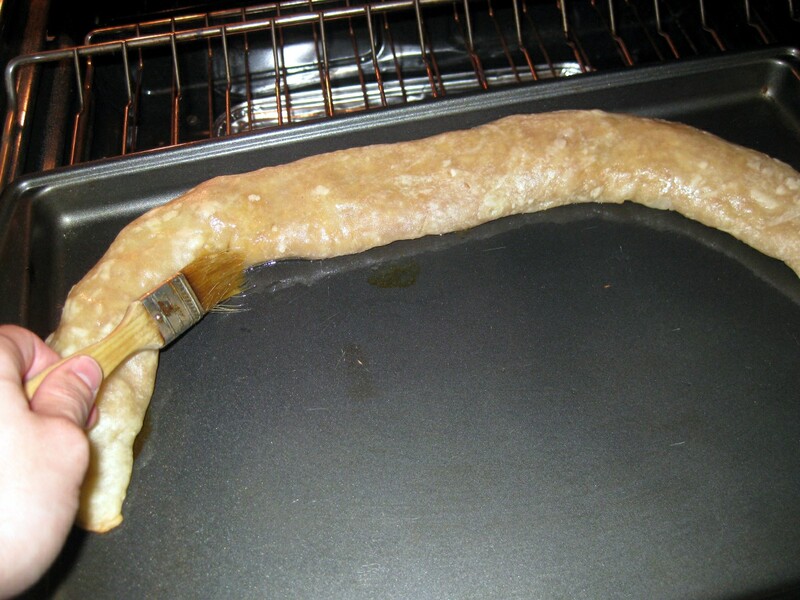 Be careful not to tear the dough. And if it gets stuck in a place or two, use the brush to unstick it. Wait for the strudel to cool down and the slice it into fairly thick pieces. Sprinkle with powdered sugar. Serve with coffee and you got yourself a delicious breakfast. Thank so much for the easy recipe, can’t wait to make it for my friends! 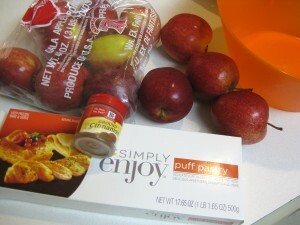 We always added fried and sweetened breadcrumbs with the apples. This was to absorb apple juices but he added flovor is so good, I won’t do without. Thank you Vilo, that is a good idea! Even though I squeezed out some of the juice (vyžmýkal) some of the juice still leaked out during baking and caused part of the strudel to stick to the pan. Next time I’ll follow your advice. IT IS DIFFICULT TO MAKE BUT IF YOU HAVE THE TIME, GO FOR IT. WE ALSO USE CHERRY PIE PEACH PIE AND STRAWBERRY PIE FILLING.. POPPYSEED AND CHEESE AND BLUEBERRY IS NEXT.. WE MAKE A SWEETENED CREAM CHEESE AND ALS TOP FOR A NEW TASTE TREAT..
I’ll be making it tomorrow. It’s my better half b-day and thus it’s time to make something sweet. I went through my cervical spine surgery a couple of weeks ago. Feel much better, getting back feelings in my hands and thus ready to cook again. 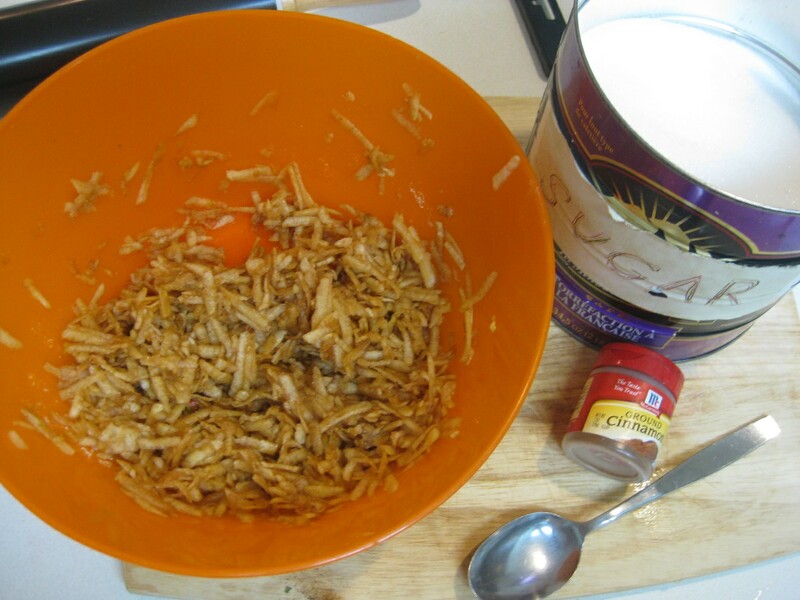 I just found you – why did I wait so long to look for Slovoc recipes. My Dad was Slovoc and I learned a few things from Grandma -(his mother). When I was young, my Dad, his 3 sisters and 4 brothers and Grandma spoke Slovoc all the time. Wish I would have paid attention more to learn the language. I still have his 3 sisters,My Aunts – still with alive. Am anxcious, now I found you, to learn more recipes. I just made this but I used a recipe from pepperidge farm’s website. It’s similar but it adds 1 tbsp flour to the mixture. I think to absorb the juices from the apples. It came out good. My born in Slovakia wife says there should be poppy seeds, too. I forgot to add that I use parchment paper instead of greasing the baking sheet. It makes clean up much easier. very delicious. 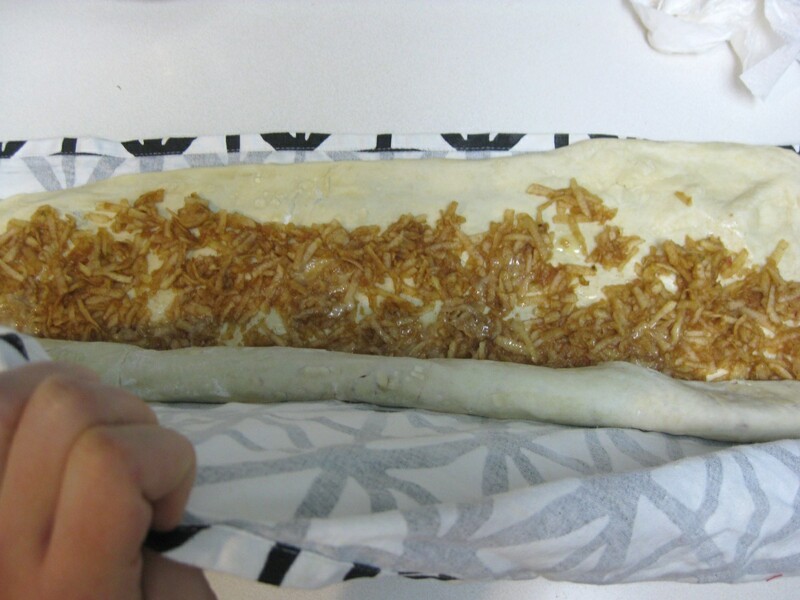 There are 4 versions of Strudel-it can also be filled with cheese, or with nuts, or poppy seed. you guys rock! My “zavins” never been 100% right, I felt there is something missing. And now when I added breadcrumbs to the shredded apple. 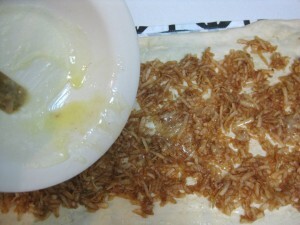 I could experience memories from my childhood when my grandma was making jablkove posuchy… Amazing, back to the future!